Andrea DaSilva is a senior analyst for Media & Entertainment Services and a Project Manager for the MDCP award with IFTA in the International Trade Administration. Fanny Chau is a Commercial Specialist at CS Hong Kong and manages Filmart for ITA. The U.S. film industry has been making inroads in Asia, and in 2012, with the ground breaking U.S.-China Film Agreement, took a quantum leap forward. China promises to increase the 20-film quota by 65 percent, and to make the process of bringing American-made movies to the Chinese market more transparent. This is great news for the independent sector, which has a competitive advantage in 3-D and digital formats covered under the new quota. Major U.S. film studios and independents alike are eager to expand market access to China, beyond co-productions that limit ownership and earnings. On the tail of this announcement, the Hong Kong Filmart, a major film and television trade event, took place from March 19-22. Hong Kong has been referred to as the “Pacific Bridge” to the Chinese market, underscored by the annual Filmart, which in 2012 attracted more than 5,800 buyers and nearly 650 exhibitors from 33 countries. The International Trade Administration (ITA) has championed the U.S. presence at Filmart for a decade, and in 2011 launched the first American Pavilion. This unique collaboration includes the Independent Film & Television Alliance (IFTA) and the International Trade Administration through Market Development Cooperator Program (MDCP) funding, as well as the Pacific Bridge Initiative (PBI), an arrangement initiated by the Commercial Service in Hong Kong and the Hong Kong Trade Development Council (HKTDC). Building on last year’s successful introduction of the American Pavilion, with IFTA as host, ITA staff from Hong Kong, Washington, Los Angeles, and 10 regional economies in Asia rallied behind the largest U.S. showing yet at Filmart. The regional ITA specialists played a significant role and recruited 200 potential buyers, representing Singapore, Thailand, China, Taiwan, Indonesia, India, Vietnam and other countries in the region. IFTA brought a mix of 40 independent production and distribution companies, including film and television agents to exhibit at the American Pavilion. Commercial Service Hong Kong and IFTA facilitated business meetings between the buyers and the American exhibitors. As a result of this concerted effort, more than 200 deals worth nearly $9 million were completed, and the deals are still rolling in. Total U.S. exhibitor numbers were up by 40 percent from the previous year, attesting to the success of the Pavilion and the combined efforts across ITA’s foreign and domestic posts. Commercial Service Hong Kong was instrumental in the overall success of the Pavilion, and with regional and U.S.-based staff, provided market research, export counseling, and the collection of export successes from each Pavilion exhibitor, in a truly collaborative effort. 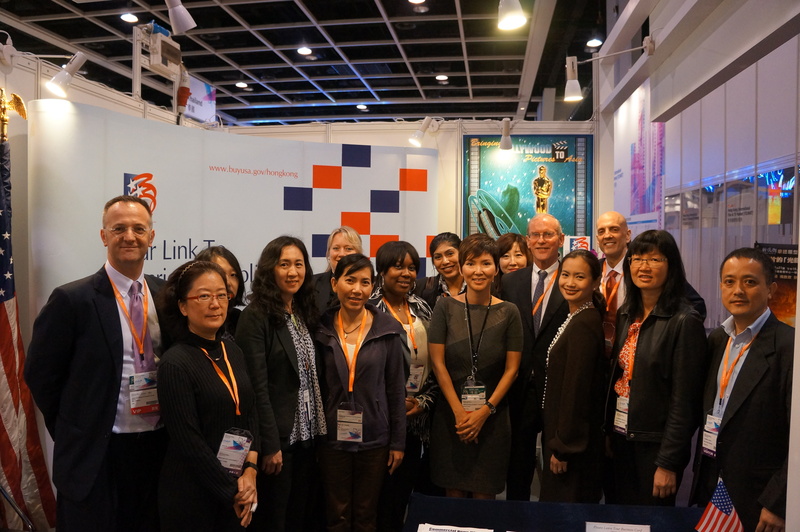 Consul General Stephen Young, together with the show organizer HKTDC and the PBI, hosted a networking reception exclusively for the U.S. exhibitors. MDCP partnerships support projects that enhance the global competitiveness of U.S. industries. They also recognize the ability of trade associations and non-profits to support small and medium-sized businesses to compete globally. MDCP partners pledge to fund a minimum of two-thirds of the project cost and to sustain the project after the MDCP period ends. On average, between 1997 and 2011, every dollar invested in MDCP projects generated $211 in exports.